Miss Vinnie Knight is a well-known jazz and blues singer with an angelic voice and a sophisticated sound. She has recorded the music of Duke Ellington and toured many European countries. Miss Vinnie Knight has a profound love for music theater. 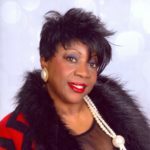 She Has written and produced a musical review, “Black Pearls and White Diamonds, Jazz songs of the Harlem Renaissance.” Come hear the real deal at the Inkwell Cafe, 408 Rogers Avenue, on Friday, July 22, 7:30-9:30. You can preview Friday’s show here.